Azalea, champion of the Dunes course. 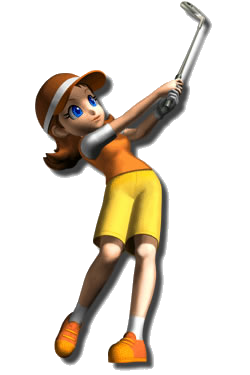 Azalea is a human female golfer in the Mario Golf series. In the Game Boy Color version of Mario Golf, she is one of four characters that the player can choose from at the beginning of the game and train however they like. Azalea can then be uploaded to the Nintendo 64 version of the game to play as. In Mario Golf: Advance Tour, Azalea defeats Tiny, takes the title as champion of the Dunes course, and sides with him as a doubles partner for the Dunes Club Doubles Cup. When Neil or Ella defeats her, she realizes how Tiny must have felt when she defeated him. According to the Mario Golf manual, Azalea is seventeen and is an experienced athlete who also runs track. Also according to the Japanese website of Mario Golf, her form was poor the first time she attempted golf, but with her father's help, she has improved over two years of training. In all of her appearances, Azalea's design resembles Princess Daisy in her sporting outfit and is portrayed as a skilled, young individual. Azalea has large blue eyes with two eyelashes, rose defined lips, and burnt orange hair flipped upward in the back. In Mario Golf, she wears an orange tank top and collar with a white shirt underneath, both tucked into her thigh-length yellow shorts that have an orange trim. She has a visor with a red "N" depicted on it, likely referencing Nintendo. She also wears orange shoes that have a white sole and one white golf glove. In Mario Golf: Advance Tour, Azalea's design has been updated, and she is depicted as being fairly tall; about the same height as Peach and Daisy. Her tank top is no longer tucked in and her shorts are slimmer and knee-length, but lack the orange trim. Her visor is replaced with a brown cap with a white line around it and her shoes now have orange soles, tips, and shoelaces. Noticeably, her hair is slightly longer. I used to do track and practice was pretty tough. But thanks to that, I got a tough lower body. Did that sound vulgar? It's been 2 years since I first started playing golf, but I am gradually improving with my father's guidance! I am thinking that I do not have much ability yet, but I have recently been chosen as a representative of my school! Lucky me! This page was last edited on February 17, 2019, at 12:08.